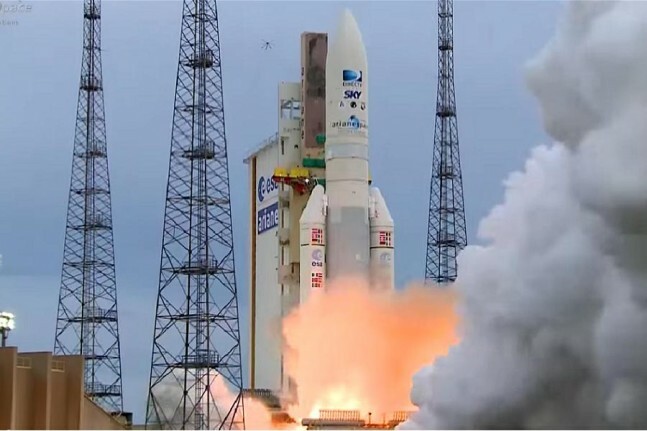 An Ariane 5 rocket successfully launched two communications satellites on Wednesday, May 27, 2015, at 6:16 p.m. local time (5:16 p.m. EST) from Ariane Launch Complex No. 3 (ELA 3) at the Spaceport located in Kourou, French Guiana. 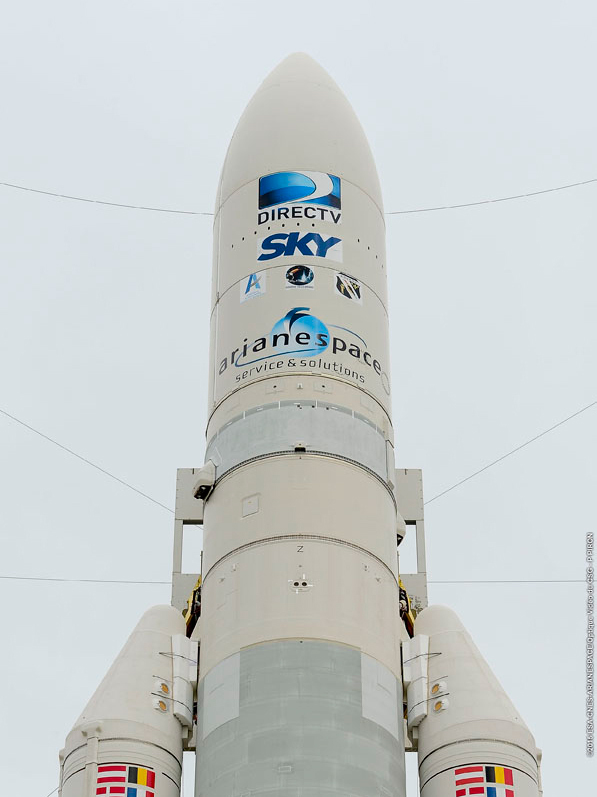 This marked the 223rd Arianespace mission to date and was designated Ariane Flight VA223. The booster delivered both the DirecTV-15 and Sky Mexico-1 satellites into orbit. “I’m delighted to announce another Ariane 5 success! Our on-board telemetry system confirms both payloads separated as planned,” Stéphane Israël, Arianespace CEO, said shortly after the launch. The Ariane 5 ECA (Cryogenic Evolution type A) – the most powerful version in the Ariane 5 family of rockets – was employed for this flight, a vehicle that is an improved version of the generic Ariane 5 launcher. The fairing protecting the satellites was jettisoned at T+191 seconds, about 48 seconds after the launch vehicle’s boosters were jettisoned at approximately at T+143 seconds. DirecTV-15 was deployed first in today’s flight sequence at nearly 28 minutes after liftoff. Built by Airbus Defence and Space, the satellite will provide 28 active Ku-band and 25 active Ka-band/Rev-band transponders, and will offer new HD and 4K UHD direct TV broadcast services for the contiguous U.S. (CONUS), Alaska, Hawaii, and Puerto Rico. DirecTV-15, a U.S. television broadcasting satellite, is based on the Eurostar E3000 platform, and has a mass of 13,669 lbs (6,200 kg). It’s the 100th geostationary telecommunications satellite built by Airbus. The first DirectTV satellite was launched on Dec. 17, 1993. Airbus currently manages the entire industrial supply chain, from the manufacture of equipment and stages to the complete integration of the Ariane 5 launcher in French Guiana, in line with the customer’s specifications. Approximately 10 minutes after the deployment of the DirecTV satellite, Sky Mexico-1 was separated, completing the flight sequence. The Orbital ATK-built satellite, equipped with 24 active Ku-band and two active Rev-band transponders, will provide HD direct TV broadcast services for Mexico, Central America, and the Caribbean. Sky Mexico-1 uses a GEOStar-2.4E platform, and has a mass of 3,000 kg. It’s the 26th satellite built by Orbital ATK that was launched by Arianespace. Lift performance for the mission was approximately 9,960 kg., which included 9,200 kg. 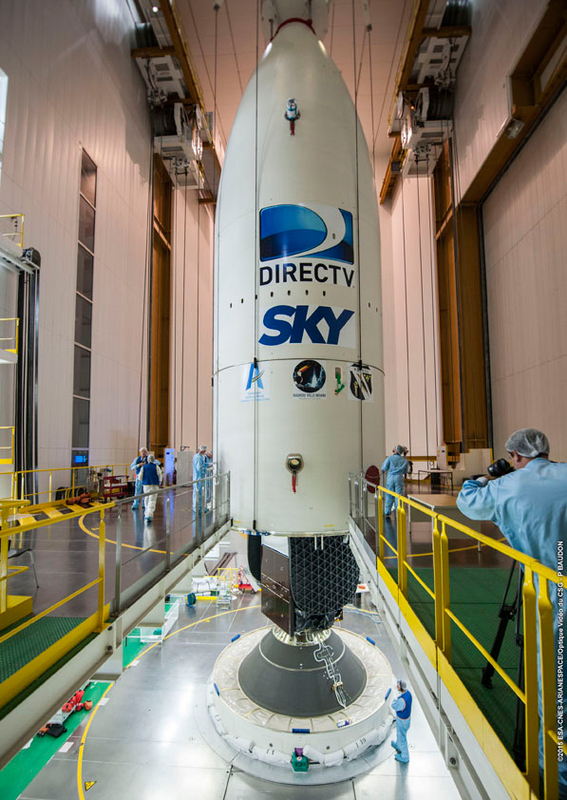 for the DirecTV-15 and SKY México-1 payloads, along with associated hardware for the launcher’s SYLDA dual-passenger dispenser system and satellite integration hardware. The lifespan of both satellites is approximately 15 years. The main stage is expected to fall back in the Gulf of Guinea, off the coast of Africa in the Atlantic Ocean. Flight VA223 was the fourth mission in 2015 using an Arianespace launcher, following one previous mission each with Ariane 5 (Flight VA222 with THOR 7 and SICRAL 2, carried out on Apr. 26), Soyuz (VS11 with two Galileo Full Operational Capability satellites, conducted on Mar. 27), and Vega (Flight VV04 with Europe’s IXV spaceplane, carried out on Feb. 11). “VA223 is Arianespace’s fourth success this year… and we’re hard at work to ensure there are more to come!” Israël said. This mission is also testing the DEMOFLIGHT program objectives. The testing will validate the thermodynamic behavioral models of the tanks, evaluate the effectiveness of the engine chilldown procedures and evaluate the effectiveness of the propellant settling procedures. Today’s mission, the 79th launch of an Ariane 5, continues Arianespace’s busy launch schedule in 2015, during which the company is targeting 11 mission in total – based on the availability of payloads – using its full family of the heavy-lift Ariane 5, medium-lift Soyuz and lightweight Vega launchers.